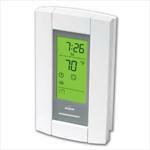 The Honeywell Aube TH-115-AF-GA model thermostat offers advanced features for comfort and control. Its ease of programming, large backlit display, and ability to read both ambient room temperature and floor temperature are just a few of its features. Capable of controlling both 120 or 240 volt systems, this thermostat is rated at a maximum of 15 Amp.